Equimax paste contains ivermectin for routine worm control and praziquantel one of the world’s most effective tapeworm treatments. Ideally Equimax should be used at the beginning and end of the grazing season to provide maximum control against roundworms, tapeworms and bots in the spring and autumn ensuring your horse starts and ends the year as free as possible from worm infection. Equimax is quite different from all other horse wormers. In fact, it was the first horse wormer effective on all major Parasites, including tapeworms and bots, in a single dose. Equimax is an all-in-one, combination wormer containing two different active ingredients. The combination of ivermectin and praziquantel is capable of treating multiple-specie infestations. This means Equimax has the best combined efficacy and the broadest spectrum of activity of any wormer. Equimax is the only product registered to treat all 3 species of equine tapeworm. Use Spring and Autumn as a single dose for tapeworm. Lasts 8-10 weeks. 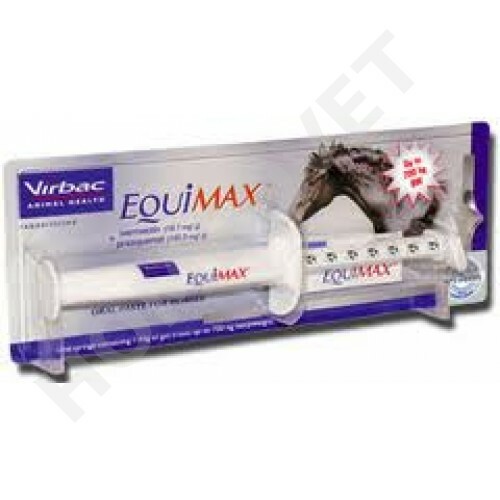 Equimax is safe to use in all horses including pregnant mares, stallions and foals over 2 weeks of age. Safety trials have proved that it has no effect on pregnancy or fertility. Some horses carrying heavy infection of Onchocerca microfilariae have experienced reactions with swelling and itching after treatment. It is assumed to be the result of death of large numbers of microfilariae. These signs resolve within a few days but symptomatic treatment may be advisable. Equimax Oral paste for Horses has been formulated specifically for use in horses. Dogs and cats may be adversely affected by the concentration of ivermectin in this product, if they are allowed to ingest spilled paste or have access to used syringes. Withdrawal period- Horses may be slaughtered for human consumption only after 35 days from the last treatment. Container disposal- Any unused product or waste material should be disposed of in accordance with local requirements. Ivermectin is EXTREMELY DANGEROUS TO FISH AND AQUATIC LIFE. Do not contaminate surface water or ditches with the product or used containers. Part-used syringes should be stored below 25° C.
Prescription required- Homeovet Vet.Practice free prescription service.